February was a month where I tried something new for the very first time in my life! 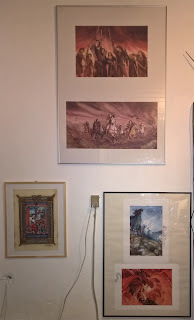 Our oldest moved out, leaving us to reorganise the house, which has included setting up a nice office space, where I have been able to gather my Tolkien matters right next to my desk. Being quite satisfied with the set-up, I share a few pictures of my new ‘Troels den’ below. As usual, I make no claims that any of this is new or relevant to anyone, and I certainly do not claim to be complete (given the many things I choose to ignore, that would be silly, indeed). I am not sure how keen Tolkien would have been on being associated with a ‘Recreational Marijuana Dispensary’ such as Old Toby's in Chehalis, Washington, but there is a part of me finding this an almost nostalgic reminder of an earlier view of Tolkien – see especially Dale Nelson's series Days of the Craze about the reception of Tolkien's work in the 1960s USA. On the auctioning of a signature card Tolkien signed for Mrs. Gould in Bournemouth for insertion into her book. In which Anderson also comments on the upcoming annotated edition of A Secret Vice, and on a review of Grevel Lindop's biography about Charles William by A.N. Wilson. Though I am normally not particularly interested in the details of the lives of the Tolkien children (or grand-children), Bradford Lee Eden manages to tell the story of his research into Tolkien's second son, Michael Hilary Reuel Tolkien, in a way that is engaging and interesting. I fully understand the curiosity that drives this kind of exploration, and Eden's way of narrating the process of discovery rather than the dry facts of the results helps to make this article a worthwhile read. What unfortunately remains unexplored is what, if anything, this can tell us about J.R.R. Tolkien and his work, and thus it remains unclear why this story is relevant in a journal focusing on the father. This is a very interesting article with a solid overall thrust, but also with some problems that make me rather torn about it. Beal looks at the concept of invisibility as developed in The Lord of the Rings, and applies a number of critical techniques to this, giving the article a well-rounded approach to the topic. Comparing Bilbo's role in conveying the messages of the leader (Thorin) while the Dwarves are captives of the Elves in The Hobbit to Tolkien's rank as signalling officer is well spotted, as is the idea of soldiers feeling in some sense ‘invisible’ on the battle-field, but other biographical comparisons do not work as well as these, and attempts to link Tolkien's role as signalling officer with the concept of invisibility feel particularly unconvincing. Beal's discussions of the moral, literary, and theological aspects of invisibility in the context of this power of the Master Ring as it evolved in The Lord of the Rings are masterful, but attempts to apply this to aspects of the earlier story (outside of the opdated ‘Riddles in the Dark’ chapter) are, in my considered opinion, mistaken – here Beal tries to force something into the earlier book that simply isn't there. A minor weakness, which I suppose primarily concerns me qua my education in physics, is the references to optical theory that are just simply incorrect from a physical point of view, and which therefore, to my physicist's mind, weaken the argument. Overall, however, I do think it is very much worth your while to read this article, though it would have benefitted much from some additional editing, cutting away the weaker arguments (cutting it by, perhaps, a third) would leave the strengths so much clearer. closed, so that I can enjoy these. This is important in order to understand that Tolkien would, in his scholarly work, be interested in, and work with, questions that would, by modern standards, belong to other disciplines. The example Cook uses here is the relationship of memory (and hence forgetfulness) and story (including folk-lore, and probably also fairy story) in the creation (I nearly wrote sub-creation) and transmission of history. All in all an excellent post! Presenting a Master's Thesis from the University of Iceland, Number Symbolism in Old Norse Literature: A Brief Study. This 50-page thesis should go very well together with Christopher Kreuzer's paper, ‘Numbers in Tolkien’, in The Ring Goes Ever On: Proceedings of the Tolkien 2005 Conference, which are still available from the Tolkien Society. Karl Seigfried here provides his own prose translation (following the example of e.g. Tolkien's prose translation of Beowulf) of the Old English poem, The Wanderer. The poem is often cited as an important source for Tolkien, not least the Lament for the Rohirrim recited by Aragorn (“Where now the horse and the rider? Where is the horn that was blowing? […]”), and Seigfried touches on this and a number of other parallels in his commentary / annotations. Instead of here trying to summarise all the Tolkien-relevant parts of Seigfried's comments (risking to overlook something), I invite you to read through the whole article. More from the 1966 Diplomat magazine with its Tolkien theme. Interesting, to say the least. In this excellent post, Karlson addresses comments, e.g. by Garth and Flieger, that Tolkien's fascination with the story of Kullervo from Lönnrot's Kalevala was strange in the context of his faith, suggesting that it was inconsistent with his Roman Catholic faith. Karlson disagrees with this assessment, and instead finds that Tolkien “shows us that what might seem impossible if we rely upon a fundamentalist mindset is possible, and not because of lack of faith, but in and with it.” Tolkien, according to Karlson, was a twentieth century representative of a Roman Catholic tradition of entering into dialogue with “the followers of other religions” (or in this case, their myths and beliefs) and find what is good and true and valueable therein. Though I do not know if this is Karlson's intention, this also, to me, offers a frame for understanding both why it is important to take Tolkien's Roman Catholic faith into account when trying to understand him, but also why it is insufficient in itself. There is much more to Tolkien's life and work that one needs to take into account, but his faith is a part of the metaphorical lens through which he saw and understood the world (as was his philological training, his war-time experiences, and much else). A very fine analysis of Tolkien's use of heathen twice in The Lord of the Rings. Though I suspect that Hillman puts too much into the word ‘back’ in the statement from the ‘Akallabêth’ that Ar-Pharazôn “turned back to the worship of the Dark”, this is, overall, probably the finest analysis I have seen of Denethor and Gandalf's use of ‘heathen’. Asserting that Tolkien's writing style is more reminiscent of the myths and legends of ancient days, Greek histories, Norse sagas or the Middle-eastern Bible, is of course not new. Alina H here also claims that this is a essential ingredient in making the work believable – what I might have called establishing that inner consistency of reality that induces literary belief. I think this is, to some extend, correct, but I would also say that the validity of this argument goes along with the metafiction of ‘Tolkien the translator’. A more traditional work of fiction without this metafictional transmission would, by the logic of this argument, not benefit from Tolkien's writing style – and that statement probably highlights what I think is the greatest weakness in Alina H's analysis. Simon Cook is entirely right when claiming that Tolkien's Faërie is not just some magical otherworld of make believe. 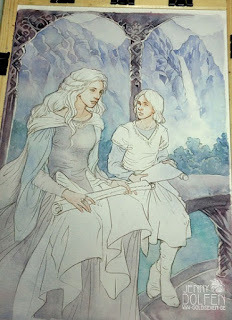 Faërie is not just Valinor, reachable only on the mystical ships of the Elves, but it is far more present. He is also right in pointing out the connections between Faërie and the natural world, but identifying the two as the same thing is an error. Smith goes into the woods to reach Faërie, but he moves through the woods and at some point reaches Faërie. Faërie is more than just the natural world – even “as experienced by those who truly belong to it” – but it is connected to the natural world, and I suspect that Tolkien might say that Faërie can only be reached through the natural world (except by enchantment, as when reading a good story). Excellent post, well worth reading! One minor point is that Christopher Tolkien does, in The War of the Ring p.97, state that the differences between the versions of Gandalf's words in book I, ch. 2 and book IV, ch. 1 “remain different in detail of wording, perhaps not intentionally at all points.” I would say that the final words, which I have emphasised, are precisely an acknowledgement that the differences are intentional at some points, and Christopher Tolkien's discussion of the words Hillman stresses, “fearing for your own safety”, strongly suggests that he thinks that this is indeed intentional. A further discussion of these points, taking Tolkien's discussions in various letters into account, would be very welcome, indeed! Not explicitly Tolkien, but combining myth, fairy stories and modern viking stories (in this case the History Channel TV-series, Vikings) can never be wholly disconnected from Tolkien. An excellent point, really. It is, however, typical of the more anthropocentric view of The Lord of the Rings that the focus is on death rather than on the key part of the Gift (or Doom): freedom. Freedom to shape their lives beyond the Music, and thus to shape it beyond, or around, their Doom of death. 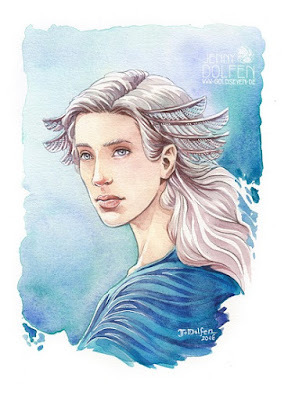 I would argue that it is only Men who could do this, not because the other races cannot die, but because only Men have the power to, as Flieger suggest, actually reshape the Music (“the free choices of Men will have the power to alter the destinies of Elves.” Splintered Ligh, ch. 15). As Martinez says, “great question”! And a fine answer. Adding to this, I think that Tolkien's assertion than Frodo's was not a moral failure, particularly in the context of Tolkien's explications of this moment in this and other letters, suggests that Frodo was not acting with free will in this moment – that his choice to claim the Master Ring for his own was not made as a free choice. At a minor point, I disagree with the implication that the Master Ring has a ‘will’ as such – the Master Ring is, in my considered opinion, not sapient in any way. Roz Kaveney opens with the question of whether “Can we accept, perhaps, that The Lord of the Rings is a good, intelligent, influential and popular boo but not a transcendent literary masterpiece or a work of supreme wisdom?” I see it as a rhetorical question – possibly a tongue-in-cheek warning that if you do believe that The Lord of the Rings is “a transcendent literary masterpiece or a work of supreme wisdom”, then you might not want to read the review. Personally I hope that nobody, myself included, will ever trust me to identify supreme wisdom, and much less transcendent literary masterpieces. I can recognise what I, personally, like when I meet it, but I'll keep it at that! The human mind apparently likes to keep things simple, but reality rarely is, and I think Kaveney should be lauded for trying to point out that things are more complex, really. A review of Diana Pavlac Glyer's 2015 book, Bandersnatch: CS Lewis, JRR Tolkien, and the Creative Collaboration of the Inklings. Svendsen is clearly very enthusiastic, praising also the illustrations and the accessiblity of the book. One sentence probably highlights the differences in Svendsens and my approaches. He writes, “She admitted that the earlier book was more for scholars, but this was for general readers.” If I had written that, I would probably have said that Glyer had admitted that this was a reworking of her earlier book for the general public. Personally I much prefer the language and structure of scholarly works that require their readers to think and reflect, and this seems to be no exception. The art book by Joe Gilronan from Oloris Publishing, From the Shire to the Sea is now available for pre-order! A review of Tolkien's The Story of Kullervo edited by Verlyn Flieger that gives the book 8 out of 10.Most of the review is a summary of the story of Tolkien's Kullervo retelling, and the reviewer does not really engage with Tolkien's Kalevala essay. About the upcoming release of this extended edition, A Secret Vice: Tolkien on Invented Languages edited by Dimitra Fimi and Andrew Higgins. I'm certainly looking forward to that one! Gandalf lighting up a pipe in Moria. This is a fragment from the next picture, Lord of the Third House in Middle-Earth. Portraying “Finarfin's farewell to his children”. See also his Gloomy Woods II piece from 29 February. Though not made to illustrate Tolkien's Middle-earth, this piece could also easily portray one of the gloomy forests of Tolkien's world. The ghost of Finduilas on her mound, the Haudh-en-Elleth. This piece is not more wrong than most of what you see, and it's more right than many. Still, I do wish that writers would do a bit of research before making such blanket statements – if the author would just have limited his piece to apply to the published Silmarillion, the more serious problems would have disappeared (there would still be some minor issues for readers to nitpick). Addressing some relevant questions pertaining to Martin's comments on the lack of information about Aragorn's tax policies. Well said! 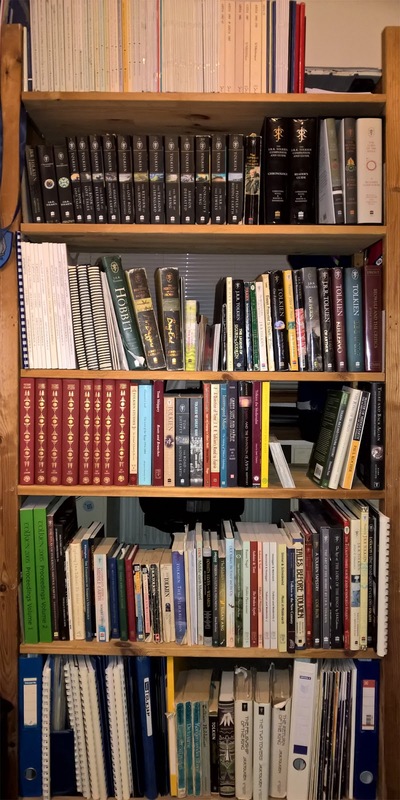 It is always good to hear of someone who loves their old Tolkien books and keep them around. I haven't thrown out any of my Tolkien books, though the Danish paper-back book club edition of The Lord of the Rings, Ringenes Herre from Gyldendals Bogklub, that I got for my 18th birthday (more than three decades ago) is in tatters. I know I am not the only one with an interest in how references to Tolkien is used in modern political argumentation, and clearly Hayes has given this some thought, here offering some reflections on a specific way of using Tolkien references (specifically to the Master Ring) to make a political point. Incidentally, I think Hayes is spot on with his comment that “even attempting to answer [a question posted in a Tolkien newsgroup] would indicate that one had missed a central point of the story.” This could be extended to a great many of the questions I see asked in various Tolkien fora. On the visit of the Greek Tolkien Society, The Prancing Pony, to the Greisinger Tolkien Museum in Switzerland. In this post, Martinez seems to me to discuss the relations of fan receptions, scholarly receptions, and scholarship on fan receptions (all of Tolkien's work – both his own scholarship and his fiction). I am not entirely sure what Martinez is trying to say here. At one point he sets up two worlds, one of scholarship and one of fiction, that he appears to think of as entirely separate things (which I don't think they are), and at another point, he seems to suggest that future scholarship will treat Tolkien's own work and the fan receptions as one and the same (which I doubt). In both cases, I actually think that my reading is flawed, but I am not sure what Martinez' intention is. About whom, or what, the Master Ring was intended to rule. A long thread with many side-tracks that takes its starting point in the simple question of how on Middle-earth Treebeard could have mistaken Merry and Pippin for small orcs? The web site features a podcast series by the society, which includes both lectures by scholars, both resident and visiting, and the society's own discussions of Tolkien's works. From February 2016 you can find e.g. The Cycle of Order and Chaos in the Lord of the Rings by Dr Natalie Van Deusen, and Dr. William Thompson's lecture, Of Hobbits, Elves, and Talking Dragons: J.R.R. Tolkien and the Journey into Faerie. A new public Facebook group aiming at confirming – or more likely disconfirming – quotation attributed to professor J.R.R. Tolkien, and if possible discover the true source, when this is not Tolkien. Jonathan Dent, 5 March 2013, ‘Whale-horses and morses: Tolkien and the walrus in the OED’ – About Tolkien's work on the entry for ‘walrus’. 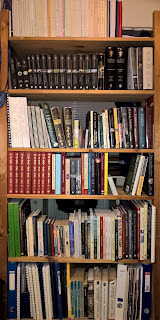 Tim William Machan, 13 November 2013, ‘Why did Tolkien use archaic language?’ – About Tolkien's archaisms and why some people may see them as problematic, but unfortunately Machan doesn't really attempt to answer his titular question. Great blog nice n useful information, it is very helpful for me, I really appreciate thanks for sharing.